With the release of AMO 5.2 a few weeks ago, we made a tiny change to every add-on download button on the website that made a huge impact: we can now see what parts of the site add-ons are downloaded from. This was previously a gaping hole in our metrics, and a subject of much contention among Nick and myself (see also: relevance of my add-on’s icon to its functionality). With the help of Daniel Einspanjer on our metrics team, we’re now able to analyze whether an add-on download came from an AMO search results page, the add-on’s display page, the Firefox Add-ons Manager, or one of around 12 predefined sources we are tracking. Some of the results were surprising, so without further ado, this is the breakdown of downloads for a single day on AMO (yesterday, in fact). Keep in mind that this covers 1.7 million downloads, so even sources that only have 1% of the pie can be up to 17,000 downloads. We’ll be digging into where our unknown downloads are coming from, but right now we think they are mostly downloads coming from other websites. We didn’t want to keep all this data to ourselves, so add-on developers will find a new view in their Statistics Dashboards called “Download Sources” where the sources for each individual add-on can be dissected. Our source tracking system also allows developers to add their own tracking codes for external links to their add-on. By simply adding a src parameter to any add-on’s URL or download URL, that source will start being tracked and appear in the Statistics Dashboard. There are some caveats to external source tracking, so be sure to read the full instructions by going to your Download Sources dashboard and clicking “learn how to track external sources”. Have fun with the data, and if your research sparks an idea for how we can improve download conversions on a particular AMO page or another great idea, let us know! * Homepage – The homepage browse box, with tabs for Recommended, Popular, Just Added, and Updated add-ons. Does not include the rotating promotion box at the top of the page. Fantastic!!!! Such a great way for addon developers to now track return on marketing spend from external sources when the download occurs on their website or even microsites they setup with publishers they are buying media from. Any chance we could get statistics from uninstalls as well? 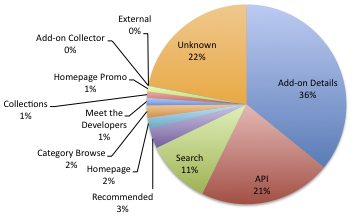 The idea being: what is an addons attrition rate by source? this would be super helpful for addon developers spending money to drive downloads (whether via google adwords, banner ads, etc). Guys, this is absolutely awesome! I couldn’t believe my eyes when I saw this appear in the dashboard a few days ago 🙂 Been using is ever since to track downloads originating from shareaholic.com in addition to the defaults. Bravo on the locale breakdowns as well! The “Download Source” area for my add-on “Pacfox” only has 3 options: “Unknown”, “Null” and “Add-on Collector”…any idea where the rest are? This is great and should help with working out where my add-ons are getting installed from. One question, at this stage I am exclusively a Thunderbird add-on developer, is there a way to simulate the src= parameter when supplying addons from my own or 3rd party websites for Thunderbird Addons? At the moment the catagories I see are “Unknown” and “null”. Is there there any way this can be clarified? And what do these mean specifically for Thunderbird? I can no longer track external sources with the parameter “?external-sourcename”. 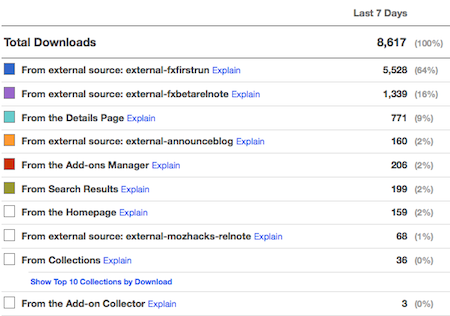 It seems that all downloads appear under the “unknown/NULL” source. This makes it impossible for me to pay my partners per download any longer. Could you please help me or tell me where to open a ticket for this issue? A great way to track return on marketing spend from external sources! i have the same problem with the parameter “?external-sourcename”… is there an update available?…how ever…great job! This is really great for addon developers! So we can now track return on marketing spend from external sources! I can no longer track external sources with the parameter “?external-sourcename”. It seems that all downloads appear under the “unknown/NULL” source..
great job on tracking marketing spend from external sources!